Eat the Fakers. So Not Cronut. 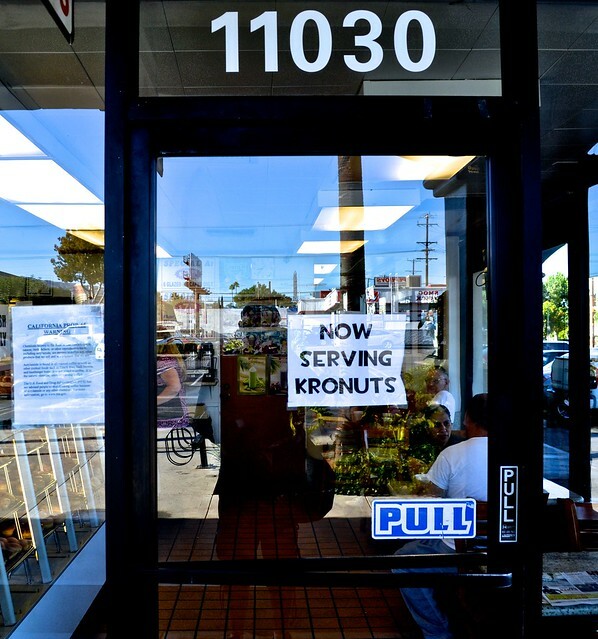 The Kronut With a "K" at Fresh Donuts Shop in Granada Hills, CA. Well, if you have been frozen in carbon for a few months, let me kwikly explain the Cronut. It's a donut and croissant hybrid filled with cream and topped with glaze. 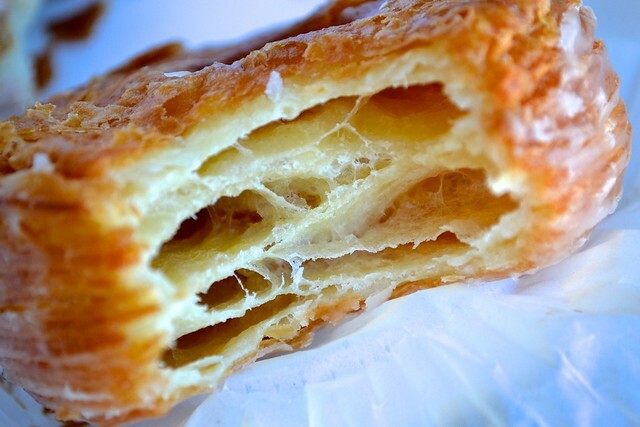 It's a pastry so popular that people are willing to wait in 4 hour long lines or sell a kidney (which, ironically enough, is shaped like a croissant) just for a taste. A bustling, little donut shop in Granada Hills, CA called Fresh Donuts is doing brisk biz hawking the fakes. The shop sells several different flavors and a plain version too. 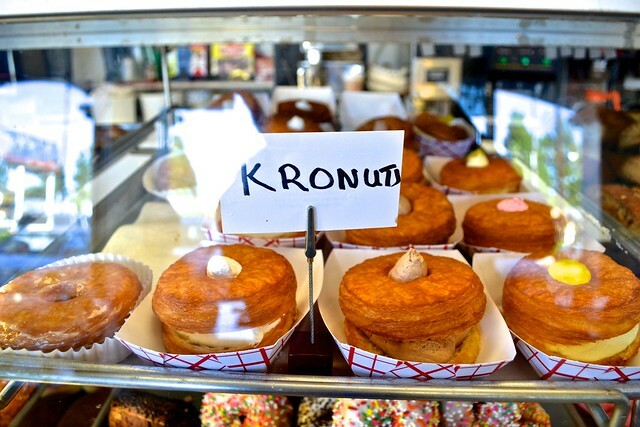 The regular Kronut is pleasingly flakey and airy. The glaring problem with this fake is that there is no cream inside. 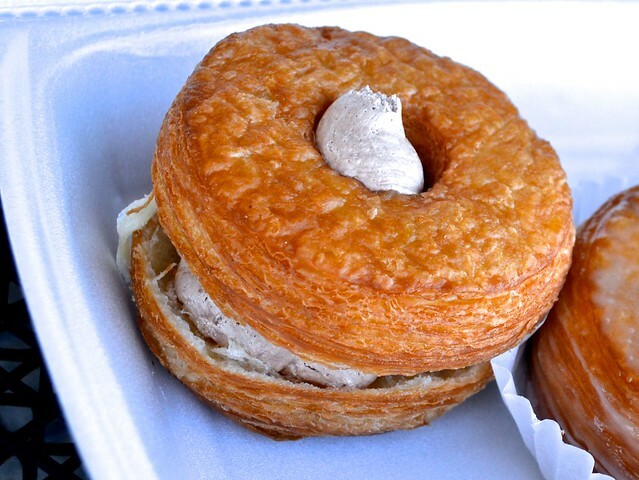 The real Cronut harbors cream that's been piped into its airy, light, crusty crevices. The glaze on the Kronut is nice enough but tastes like the typical glaze of a standard donut. The cream Kronuts do have filling but are not actually filled. Instead, they're sandwiched. A Kronut is cleaved neatly in half then spread with cream. There are vanilla, chocolate, and strawberry fillings from which to select. Nothing at all fancy about the cream. Simply fluffy and flavored. Full disclosure time: I HAVE NOT EATEN A REAL CRONUT. (I visited Manhattan twice this year and the last thing I wanted to do was wait in a lunatic long line, while severely hungover, for a croissant-donut love child.) So, as far as how it stands up against the real thing ━ I don't know. However, I would say that the plain Kronut is enjoyable texturally with the right amount of dulcet deliciousness. The cream Kronut was much more disappointing. I mean, how hard would it to be for Fresh Donuts to inject some cream into that fakey flakey pastry? Keeping in mind, though, my fewer than 2 minute wait to score these fakers, I'd say it was worth the trek to Granada Hills for these Cronut pretenders. Now, where can I score a knock-off ramen burger? I'll take a Rolexxx while I'm out there. Hey - don't do the ramen burger dude - they look truly gross! Ansel did not invent the Cronut. He simply was the first to trademark the name.